Experience an ice skating rink like no other! Grab your skates and enjoy this outdoor rink in the heart of Kiener Plaza. In the shadow of the Gateway Arch or under its new lights, the Winterfest Ice Rink is a great winter destination with regular hours and special events November 17, 2018 – January 1, 2019! Enjoy the rink, sip hot chocolate in the renovated park, or explore the play ground. Children skate rentals are free on Thursdays and Fridays – courtesy the St. Louis Blues! Gateway Arch Park Foundation members will receive $2 off skate rentals throughout the Winterfest Ice Rink Season*. Click here to reserve skate rentals online. 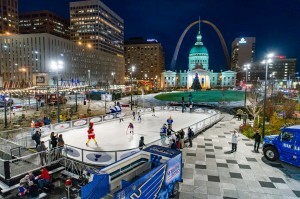 Click here to purchase Arch Tram & Ice Skate Rental Combo tickets. Kick off the 2018 Winterfest Ice Rink season! Join us at A Winter’s Dinner Thursday, November 15 at Ruth’s Chris Steak House! RSVP on Facebook for updates and special giveaways. Saturday, November 17: Opening Day noon – 8 p.m. & Festival of Lights 4 – 8 p.m.
Friday, November 23: One Nation Night 5 – 8 p.m.
December 31: New Year’s Eve Party: 4 – 8 p.m. with fireworks at 8 p.m.
January 1: New Year’s Day Skate – last day of Winterfest Ice Rink season. Youth can try hockey for free at Little Blues sessions with the St. Louis Blues. Click here for more info and registration.